1936-37 American History Class of Glas﻿co R﻿ural High School. The area's first residents were Pawnee Indians living in a village located on the banks of the Solomon River, near to where Glasco would one day be built. The first permanent "settlers," John Hillhouse, Robert Smith and John Hendershot, arrived in the area 1865. They were soon followed by H.H. Spaulding and A.D. Teasley in 1866. In 1869, a post office was established and a stockade built. Glasco's first settlers spent one winter in this stockade as protection from Indian related troubles. The establishment of the town site came about in part from a Revolutionary Land Grant provided by the U.S. Government to Isaac Biggs, another of the community's earliest pioneers. This was proceeded by the incorporation of the Dell Ray Town Company, July 18, 1871 and our community's first name, Del Ray. 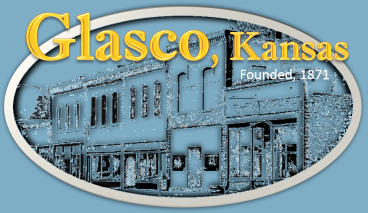 The community's name, as we all know it today, Glasco, was officially adopted by the Kansas state legislature in 1878. It was incorporated as a city of the third class on April 14, 1886. 1873, 1874 --Grasshoppers ate everything, "even wooden tools." 1921 --Glasco High School built. It still remains in use as a school, today! 1890s --Town Baseball Team organized.